Similar Balls: Same Hook Potential, Lane Conditions & Coverstock as the Track Paradox V.
Great looking & great rolling ball! What great shelf appeal! 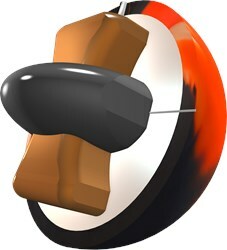 This ball certainly catches your eye! Not only does it look great, but it rolls great, too! I went with a smoother, pin-down layout to control the backend reaction. The Dual Angle Layout numbers are 55 x 4 1/2" x 80. This ball stores plenty of energy through the front part of the lane, but doesn't overreact as it exits the pattern. I am truly impressed! If you're looking for a great compliment to the Paradox Black, look no further! This ball creates PLENTY of backend reaction! I have really liked the Paradox line. My favorite of the line is the Trilogy and now the Paradox V. This ball is clean through the front part of the lane and strong at the break point. It drives hard through the pins. Definitely a smoother rolling ball and gets down the lane further than the Paradox Black with the same back-end strength. I use this ball A LOT. The Paradox V is the 5th bowling ball in a very successful Paradox line. The updated I-Core 2.0 allows for more flare potential, while the Prime Pearl coverstock gets the ball down the lane very easily. If you needed a cleaner version of the Paradox Black, you want to look into the Paradox V.
For me, the Paradox V is a great ball for higher friction lane surfaces. I mainly use this ball on fresh lane conditions when I need some more length through the pattern. It gives me a cleaner motion than my Paradox Black, yet still has that controllable motion down the lane. I also found this ball great for wet/dry conditions as it is strong enough to blend out the over/under reaction. This ball also goes through the pins very well! Makes me feel like my rev-rate is higher than it is! 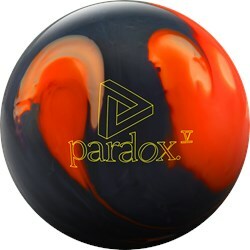 Well If Your Definitely A Fan Of The Paradox Line You Will Love The New Paradox V..This Ball Is Definitely A Ball TO Have In Your Arsenal..Pretty Versatile Ball From Different Angles Through The Pocket.Good For Medium To Heavy Oil Patterns..The Prime Pearl Coverstock On This Ball Allows You To Get Length Downlane And Smooth Backend Drive Through The Pins..This Ball Is A Good Compliment To The Paradox Black Ff That Is Hooking A Tad Too Much This Ball Would Be Your Next Option In The Bag..! Visit Your Local Proshop Today To Order One Today You Wont Be Disappointed! Can Already Tell There Will Be Some High Scores And Series With This Ball! Paradox V is great addition to the Track brand. I drilled this ball up last week and was surprised in a good way at how much it hooked off the end off the oil pattern. I would say it has a few more boards coverage than the Rhodman Pearl by Hammer but reacts different. The Rhodman is very smooth while the Track Paradox V reacts very strong to friction and goes through the pin deck very hard. The Paradox core & Prime Pear cover seem to be a great combo. Both balls will be mainstays in my tournament bag. I didn't' change the box surface for the V. I wanted to see its true motion out of the box. I drilled this ball 60x5 1/4x65 (pin below the bridge of the fingers CG swung out a little), this is a smooth layout for me and also gives me the controlled reaction I would want to see from a higher end ball on medium to lighter oil conditions. On the house shot I was able to play farther right when the lanes started to break down, the drive through the pins was excellent. I found the short sport pattern to work best for the layout. Overall I think this is valuable to the Paradox family. Does the 12 pound version use a generic core? The Paradox V will have the Same Hook Potential, Lane Conditions and Coverstock as the Storm Snap Lock. This ball has a pearl coverstock and is a high performance ball. This is not a plastic/spare ball. Due to the time it takes to produce the Track Paradox V ball it will ship in immediately. We cannot ship this ball outside the United States.